HOUSTON (AP) — James Harden has been scoring at a pace not seen since Wilt Chamberlain in the 1960s. He doesn’t want to talk about it, of course. He never does, whether things are going well or not. But it is clear he is enjoying this because his scoring outburst has coincided with Houston climbing the standings, back among the top teams in the Western Conference after an early-season slump. He scored 40 points in Houston’s win over Orlando on Sunday night to extend his stretch of consecutive 30-point games to 23, the fourth-longest streak in NBA history behind three such streaks by Chamberlain. In 13 games this month, last season’s MVP is averaging 44.1 points. He has scored at least 40 points in eight games in January, including two 50-point games and a franchise-record 61 in a win over the Knicks. It isn’t only Harden’s teammates who have been wowed by his work. Memphis coach J.B. Bickerstaff, who worked for the Rockets from 2011-16, gushed about him. Harden led the league in scoring last season for the first time by averaging 30.43 points a game, but injuries to Chris Paul and Clint Capela have forced him to carry an even bigger load this year and he’s averaging in NBA-best 36.33. If he keeps this pace up for the rest of the season he would be the first player to average more than 36 points a game since Michael Jordan averaged 37.09 in in 1986-87. If the season ended today, Harden would have the seventh-highest scoring average in NBA history behind that season by Jordan, which ranks fifth, and five seasons by Chamberlain. His average is seven points higher than Steph Curry and Anthony Davis, who are tied for second with 29.3 points a game. But as much as Harden is scoring, he’s also finding ways to get his teammates involved, and his 8.2 assists a game are tied for fourth in the league. 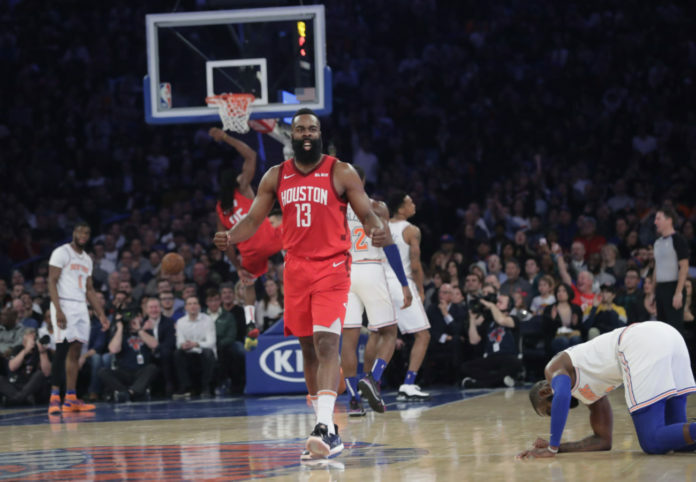 “I know the attention I draw on the court and the defense is locked on me so I try to help the guys get their opportunities to make it easier for them to score,” Harden said. As Harden has been piling up points, opponents are searching for ways to slow him down. He’s often asked about the different things teams have thrown at him and seems amused at the varying tactics. During this streak more than one opposing coach has considered it an accomplishment to limit Harden to less than 40 points. Kenneth Faried, who signed with Houston last week, has had to defend Harden in the past and noted the mindset he had when faced with that task. In the days following his 61-point show at Madison Square Garden, the Beard was asked if he feels like he’s un-guardable right now. Houston went 12-5 in 17 games without Paul, who returned over the weekend. The Rockets have won three straight to improve to 29-20 and are in fifth place in the Western Conference. While they’ve made strides since a terrible start had them near the bottom of the conference, Harden and Houston know they need to get much better if they hope to bring the team its first title since 1995. That, Harden says, is why he doesn’t like all the talk about his high scoring and why those close to him know they shouldn’t discuss it either.